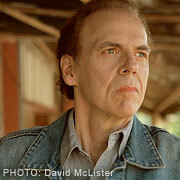 Join MusiCares and GRAMMY Foundation Vice President Scott Goldman as he interviews acclaimed musician and songwriter John Hiatt the day his new album, Dirty Jeans And Mudslide Hymns, is released. Described as "one of rock's most astute singer-songwriters of the last 40 years" by the Los Angeles Times, Hiatt's career as a performer and songwriter has spanned more than three decades and his work has been covered by everyone from Bob Dylan, Eric Clapton, BB King, Bonnie Raitt, Iggy Pop and more. Before an intimate audience of 200, hear Hiatt in conversation about his remarkable career, his most recent tour with Lyle Lovett and the making of the latest record. After the interview, Hiatt will take questions from the audience.